I was really looking forward to sleeping in a "pod" and it was as fun and unique as I expected. I have been staying in hostels since I was 19 ( now I'm in my sixties) and love them, though sometimes find the lack of privacy less than ideal. This is a hostel, but the individual pods provide complete privacy. The bathrooms too - each one has its own toilet, sink and shower stall. The family who own the hostel are friendly and helpful. Thank you for a most enjoyable stay in your pretty town. This was the best hostel experience I've ever had! The wonderful people who own the hostel were patient with our questions, gave great and accurate reviews of the shops and restaurants in the surrounding area, and directed us to a friend of theirs for handmade Icelandic wool sweaters! The breakfast was absolutely delicious, the atmosphere welcoming(fresh coffee every hour), and the perfect blend of quiet pod space and warm/homey in common areas. Thank you so much for this lovely experience! My best fiend and I booked a superbreak direct to Akureyri holiday, but we didn’t fancy sharing a room and single supplements were an additional £300 each. 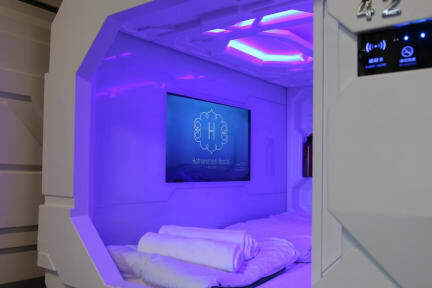 We found the perfect solution in this pod hostel. Located in the center of town and one block from our hotel. It couldn’t have been more convenient or the hosts more gracious and helpful. The shower powerful with lots of jets and well stocked with soap and shampo, the bed very comfortable and climate controlled. Highly recommend. Wonderful owner and excellent facilities, I really enjoyed my stay! It was the first time I've stayed in a hostel with pods, but I really liked getting into my little space and closing the sliding door. I slept really well with no disturbances. The breakfast was good. Great hostel experience which I absolutely recommend you to try when staying in Akureyri. The price might first seem quite high but is definitely worth the money because of the super-spacy sleeping capsules. Since there is a large breakfast buffet included, in fact the stay is (compared to the Islandic prices) not really expensive. The staff is very friendly and helps you with every issue. A lot of modern bathrooms and excellent facilities, although the laundry price is a bit high. Very cool experience sleeping in a pod! Clean and comfortable and the security here is great. Staff was super friendly and helpful in giving advice about the area. Also a great breakfast included! Great Hostel! Very clean. 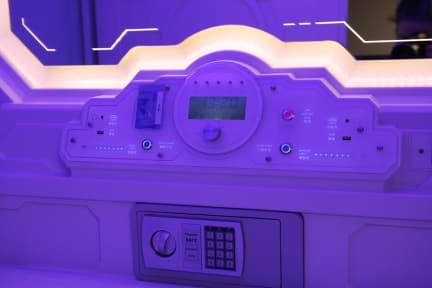 I enjoyed staying in the capsule as it provided a bit more privacy compared to traditional bunk bed set up in a hostel. The capsule includes a television with access to Comcast. However, my tv did not work and the staff were not able to fix it during my stay. It wasn't a big deal as I was out most of the day but I would have liked to see the capsule tv in action. The hostel is in a great location on Main Street. The breakfast was very substantial and delicious. Worth staying here. It's a family that started this hostel, and they're working hard to make it a great experience. They are helpful, including getting on the phone with the rental car company to speak to them in Icelandic to get them to agree to put snow tires on our car. Not the most knowledgeable about activities in the area, but you can walk across the street to the Tourist Info place or the other hostel. No bar, but several good places to go out and meet people within 2 minutes.